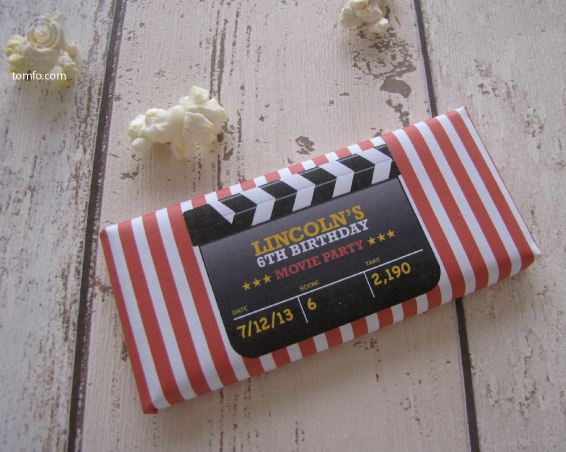 Planning a party, how about a movie party? Who doesn’t love a movie? I have been threatening for, (seems like ages) of setting up a sheet/outdoor projector screen/tv on an extension cord and playing a movie at night on our deck, I think it’s a great idea for the summer. The pic below is from my Pinterest Movie Party Board… we can do this, I’m thinking! 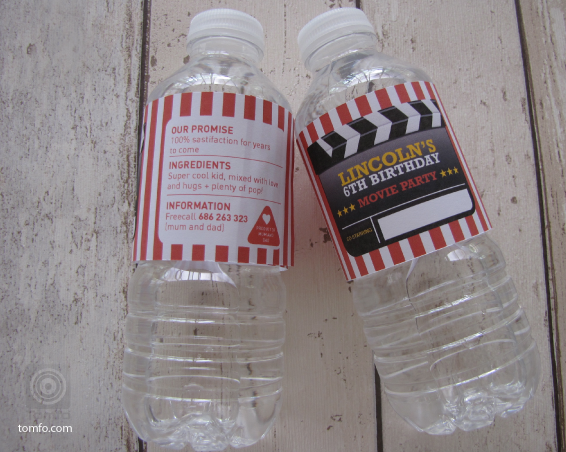 Here are a couple of ideas for your Movie Party from My Movie Party Pinterest board. Why not try one for valentines day coming up? Cold at your place? Rug up, set up an outdoor heater and watch the movies outside, or make some cozy tents like the picture below indoors. You could go to a movie theatre for a kids party or set up your own like the one above in your own backyard or deck – dont’ have a movie screen? Use a long extension cord and move your TV outside, add popcorn, blankets and let the kids experience a new environment, magic! 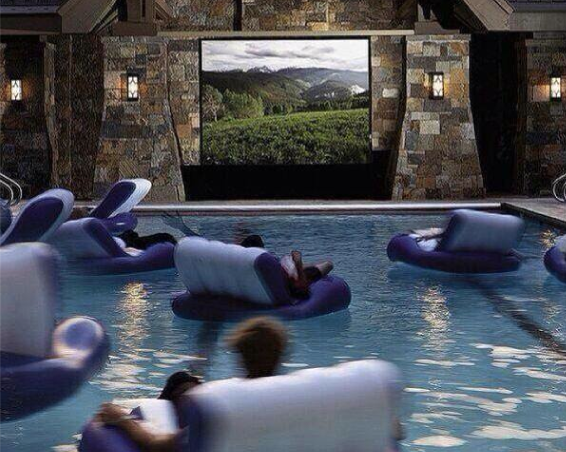 Oh… I love this idea if you are lucky enough to have a pool too. So… if you are planning a movie party in the future get in touch for some cool party printables to personalise and make your party experience extra special, here’s the lowdown on the party package.You don’t have to be a kid to have a movie party though, I think some funky tunes on arrival with some appetizers and a great surf movie or Audrey Hepburn movie could be a fab older generation celebration too, contact me if you’d like to adjust the package to suit your needs. PERSONALISED BAG TOPPER: I used a clear cellophane bag, printed out my printables, then scored and folded, filled with jaffas and fastened with a stapler. 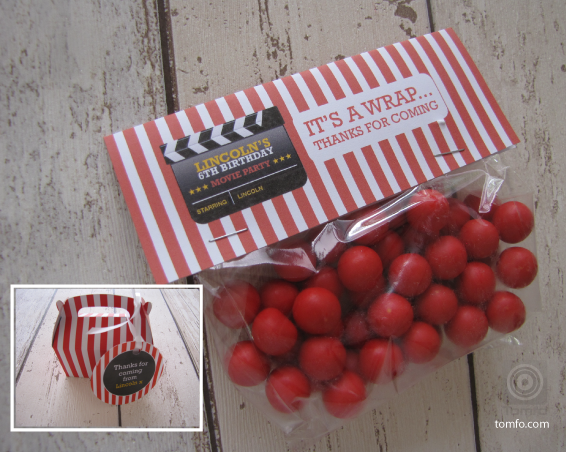 The package also includes THANK YOU CIRCLE LABELS, incase you want to use a pre-made box or bag and attach with ribbon. I printed the Personalised Circles on Avery L7256 Stickers, then stuck two together on some ribbon and tied onto a cute red striped box as an option. MINI FLAGS: The flags match in with the red and white movie theme and are also personalised with your childs name and age, you can use the flags around straws, wrap them around a toothpick and use them as cake toppers or mini bunting on your cake, they are designed to be used both portrait and landscape. PERSONALISED WATER BOTTLE LABELS: Grab yourself some 350ml or 600mL water bottles, I got mine from Aldi and used the Frantelle 350mL, however the labels have been designed to fit on both sizes. The label features a cute saying and space to write your ” Co – Starring” guests name on the bottles so everyone can keep track of their drinks. PERSONALISED CIRCLE LABLES: There are 2 designs as featured here, these can be printed out on card (I suggest using 200gsm) or print onto Avery L7256 Stickers for the best results, (if you’re not so steady with your scissors), then stick back to back on a toothpick. PERSONALISED FOOD LABLES: I never really thought it was that important to have food labels, but if you use some funky names, it makes it pretty cool, (excuse my lack of creativity on the simple titles above). Print these onto card (200gsm for best results) then lightly score and fold over. PERSONALISED CHOCOLATE WRAPPERS: I think if you have a few “party stoppers” then that “makes” the party on your big day, these chocolate bars are a quick way to make a party stopper that you can prepare the night before, so you have more time on the day of the party. Display them on a white tray and you have another stylish treat to serve. I used Aldi Choceur Mini Chocolates, these also work with Furry Friends or any 15g – 40g mini chocolate bar. Print out on normal copy paper, cut, then wrap like a present and tape to secure. PERSONALISED BUNTING: A neat way to decorate the party table or wall behind. The bunting is personalised with your child’s name. Print on 200gsm card, cut out, then hole punch and thread through ribbon (I used cheap curling ribbon) then hang as required. The good thing about the printables is you can print as many copies as you like. Prices start from $15.99 to $39.99 for the full package, head to my shop to find out more, each pdf comes with easy instructions and print tips for your home computer. Have you ever had a movie party? I so have to do one before the summer ends! Movies under the stars with my 3 guys… magic! Or perhaps “Big Wednesday” with just the big guy for a cosy night in!